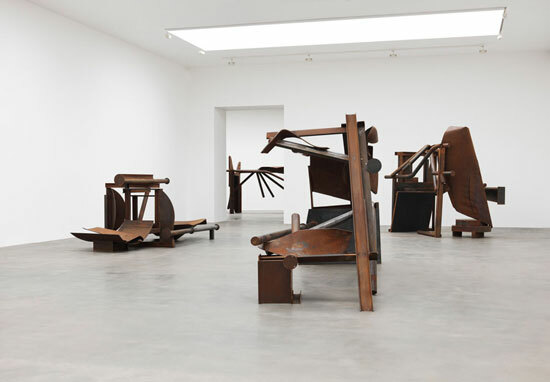 The abstract constructions in steel by Sir Anthony Caro, who died Wednesday of a heart attack at the age of 89, are bold, tough, yet infectiously ingratiating, very much like the man himself. 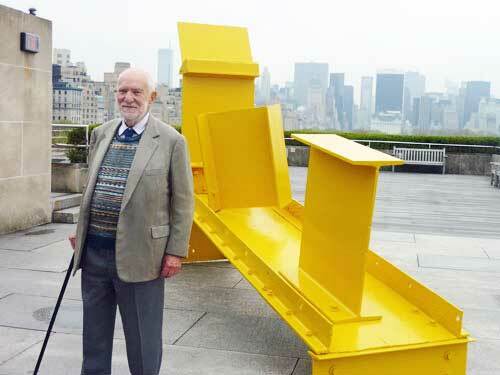 I was privileged to chat with the charming, thoughtful Sir Anthony on the occasion of the press preview for his 2011 mini-retrospective of five painted and unpainted steel constructions on the Metropolitan Museum’s Roof Garden, which I reported on (with images and video), here. At the time, he was all abuzz about his new assignment to create a work to be appreciated by pedestrians and motorists along a three-block stretch of Park Avenue (which has too often been the site of hokey plop art). To my regret (and undoubtedly to his), this ambitious project for New York was never realized. Owing to the project’s monumental cost, it was abandoned. Caro, not long downhearted, quickly divided up his maquette for the project into 12 large-scale individual sculptures. Some observers have already suggested that the Park Avenue series may come to be seen as among the major achievements of his career. That series did get public exposure at Gagosian London last summer. In discussing his Park Avenue project during an impromptu Met press conference, Sir Anthony said: “There’s a lot of challenge in that job. Let’s hope we can pull it off.” It would be a fitting (no, essential) tribute to “pull it off” now, by posthumously assembling these site-specific pieces where they belong. Gagosian has the clout and wherewithal to see that this happens. UPDATE: In an article last June, Farah Nayeri of Bloomberg had more on the Park Avenue Series at Gagosian, suggesting that what exists is a quarter-sized model of what he had planned but was not able to realize for New York City. Near the beginning, you’ll hear Caro being asked how he regards his own lasting contribution. I don’t look back. I look forward. But I think my job and the job of all serious artists is to keep culture moving, to keep sculpture moving.